So I did this rather simple card, but I really like the simplicity of such classic cards. 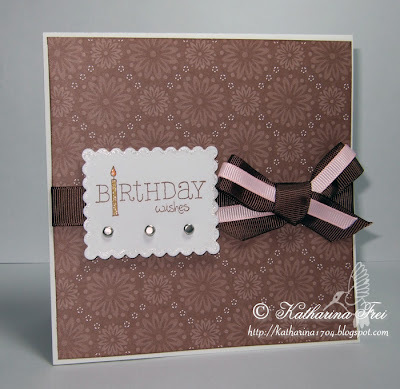 I adore the overloaded style with lots of embelishment in cute stamping, but i also fancy the simple, clear and noble style with classic cards. Manchmal brauche ich auch ein paar klassische Karten für Verwandte und Bekannte, die die Schönheit von Motiven wie Hänglar und Stänglar oder High Hopes nicht zu schätzen wissen...hihi Also habe ich mal wieder eine klassische Karte gestaltet um mein Lager aufzustocken. Accessories: brads Making Memories, ribbon Stampin' Up "grosgrain 1/4 '' Pretty in Pink" " grosgrain 5/8'' Chocolate Chip"
Oh wow was für ein elegantes Kärtchen. Dein Geschmack ist echt klasse. Die Karte hat echt Stil. Beautiful card, a little bit different that we used to from you!! But also beautiful. Could you tell me which computerprogramm you use to make the sketches?? I wnat to buy one, but have a hard time to decide which one is good.... Thanks already!! Thank you for your nice comments everyone. I was a bit unsure about showing such cards on my blog, because you all love my "other" style ;) But I guess it is always fresh to see something else! Hi Katharina, it was me, I forgot that I was logged in under FS.... Sorry!!! I tried several software, but could not manage to make flowers or scalloped borders. I will take a look for yours, and see what the price is. Maybe there is a trial version to download. Thank you!!!! wunderschön und sehr elegant. Eine superschöne Karte. Sieht die toll aus. In ihrer Schlichtheit total edel. Ich liebe ja auch die niedlichen Motive, aber an "einfachen" Karten kann ich mich auch erfreuen, da sie doch sehr rar geworden sind. Gorgeous Katharina I too love classic cards. This one is stunning, love the colours. Hi Katharina, deine Karte ist wunderschön... Sehr elegant! Lovely simple card. Those papers and stamp are just gorgeous! Thank you for leaving a nice comment on my blog. Fabulous card Katharina ..simple but lovely! I love simple cards too...I agree..perfect for those that appreciate a homemade card...but who know the difference it took 4 hrs to make or 30 min. I love your cards!! Whether they are classic or with cute image!! Excuse my english but I'm french and I don't remember very well german language!! Very pretty, and love the touch of pink on the chocolate ribbon! Simple but yet so elegant!! WOW gerade auch so schlichte Karten haben was.